As we discuss senate reform with CEFA supporters we are finding Australians are polarising between those that think the election of independents and minor party senators such as Ricky Muir has been beneficial to our democracy, versus those who were shocked and dismayed that some senators could be elected on such a tiny primary vote. We thought we’d have a look at this issue again. The Commonwealth Electoral Amendment Bill 2016 was introduced and read a first time in the House of Representatives on 22 February. Click here to have a look. The media are reporting that an agreement was reached this week between the Greens and the Coalition to amend and pass the bill. The new voting method will require electors to number at least six boxes above the line or a minimum of 12 boxes below the line (although if you accidently number just six boxes below the line the vote will still be valid) and will abolish group voting tickets. Party logos will also be prominently displayed at the top of the ballot paper and the reform will remove the ability for anyone to be the registered officer for more than one political party. What does the Constitution say about voting? The Parliament of the Commonwealth may make laws prescribing the method of choosing senators, but so that the method shall be uniform for all the States. Subject to any such law, the Parliament of each State may make laws prescribing the method of choosing the senators for that State. The Parliament of a State may make laws for determining the times and places of elections of senators for the State. What does this mean for the regular voter? The method of electing senators has to be the same throughout Australia, they must be directly chosen by the people and anyone that has the right to vote, must not be prevented from doing so. Apart from that, the voting rules are created by MP’s and senators in parliament. What’s the problem with the current system? 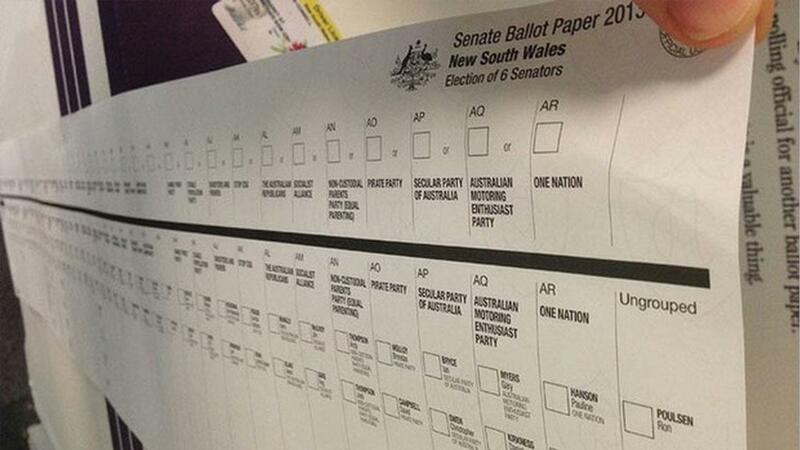 Senate ballot papers have become gigantic and for many people the thought of having to vote below the line is daunting and confusing. Voting below-the-line also takes longer. In any case, after speaking with CEFA supporters about voting below-the-line, we have discovered that many people are not concerned about the extra time it takes. They are uncertain on how to make their preferences. One supporter stated “but there are a lot of people on the ballot paper that I don’t want in my preferences”. However, this is the way preferential voting works. A voter has to number the boxes from your most liked candidates to your least liked. The same as you do for the lower house (just a lot more candidates). With all this confusion about how to vote below-the-line, 97.5% of people in the last election voted above-the-line by numbering just one box. Because we have a preferential voting system, this means that the party or group that the voter has chosen above-the-line, then allocates the preferences. Preferences are given away by smaller parties that do not get enough votes to gain a seat and also by the larger parties once a quota is reached. The spilled over votes are allocated to whoever the party has chosen. Now at the last election 32.2% of voters did not vote for the Coalition or Labor as a first preference (we should probably add the Greens as a major party now, meaning about 20% of voters did not vote for one of the majors at the last election). Do you think this means there should be about 20% independent or minor party senators? Or should we move closer to a first past-the-post system where the six candidates with the largest number of votes gain seats? Is our democracy improved by independent senators who can question and debate legislation or are they just blocking good government bills? Is the new voting system fair? You might be starting to wonder how an independent candidate without a logo on the top of the page or grouping above-the-line can compete with a candidate from one of the major parties for a senate seat. The answer is that it will be really hard. This is where a lot of Australians are split on their opinions. Some people believe that senate seats should be for professional politicians, while the others appreciate senate seats being available to people more like themselves. One aspect of the new legislation that might help encourage people to vote below-the-line is the removal of the ability of one person to be the registered office holder of more than one political party. Some experts are suggesting that this change alone will help to reduce the number of shell-parties that they say have been set up for preference harvesting. Reducing the number of candidates on the ballot will make voting below-the-line less daunting. The new system will allow a voter to make just 12 preferences below-the-line and if none of these 12 candidates are elected the vote will be exhausted. We should probably have a national conversation about exhausted votes. Could there be any Constitutional problems with the new legislation? Perhaps. There are some commenters suggesting that the new legislation may be unconstitutional in a few different ways. While others, including representatives from the AEC suggest that the government would have received advice on the constitutionality of the bill before presenting it. In any case, our system-of-government means that whenever laws are changed, they will always be subject to challenge in the High Court, which has to rule upon whether or not the amendments are constitutional. This is an important part of the Australian system of checks and balances. A High Court challenge could be initiated as soon as the legislation has been given the royal assent by the Governor-General. Senator Day has already indicated that he intends to mount a High Court challenge to the legislation. How can we ensure that voters are informed? After a change to voting methods there is always a concern that the number of informal votes will increase. The AEC has requested a period of three months to implement changes to their systems. Perhaps this three months also creates an opportunity for an education campaign to reduce the number of informal votes at the next election. As always we welcome your thoughts on this important and contemporary constitutional debate issue.